Sir Donald McCullin, CBE, Hon FRPS (born 9 October 1935), is a British photojournalist, particularly recognized for his war photography and images of urban strife. His career, which began in 1959, has specialised in examining the underside of society, and his photographs have depicted the unemployed, downtrodden and the impoverished. McCullin grew up in Finsbury Park, North London, but he was evacuated to a farm in Somerset during the Blitz. He is slightly dyslexic but displayed a talent for drawing at the Secondary Modern School he attended. He won a scholarship to Hammersmith School of Arts and Crafts but, following the death of his father, he left school at the age of 15, without qualifications, for a catering job on the railways. He was then called up for National Service with the Royal Air Force (RAF) in 1953. During McCullin's period of National Service in the RAF he was posted to the Canal Zone during the 1956 Suez Crisis, where he worked as a photographer's assistant. He failed the written theory paper to become a photographer in the RAF and spent his service in the darkroom. During this period McCullin bought his first camera, a Rolleicord for £30 when stationed in Nairobi, Kenya. On return to Britain, shortage of funds led to his pawning the camera and his mother used her money to redeem the pledge. In 1958 he took a photograph of a local London gang posing in a bombed out building. He was persuaded by his work colleagues to take his photograph of The Guvnors, as the gang was known, to The Observer, who published it, setting him on his path as a photographer. Between 1966 and 1984, he worked as an overseas correspondent for the Sunday Times Magazine, recording ecological and man-made catastrophes such as wars, amongst them Biafra in 1968, and victims of the African AIDS epidemic. His hard-hitting coverage of the Vietnam War and the Northern Ireland conflict is particularly highly regarded. He also took the photographs of Maryon Park in London which were used in Michelangelo Antonioni's film Blowup, In 1968, his Nikon camera stopped a bullet intended for him. Also in 1968, on 28 July, he was invited to photograph the Beatles, then at the height of their fame and in the midst of recording The White Album. These sessions, made at several London locations, have become known as The Mad Day Out. They contain many well known images of the band, including the gatefold sleeve picture from the Red and Blue compilations, where the Beatles mingled with the crowd seen through railings. The photographs from this day were published in the 2010 book A Day in the Life of the Beatles. In 1982 the British Government refused to grant McCullin a press pass to cover the Falklands War, claiming the boat was full. At the time he believed it was because the Thatcher government felt his images might be too disturbing politically. He is the author of a number of books, including The Palestinians (with Jonathan Dimbleby, 1980), Beirut: A City in Crisis (1983) and Don McCullin in Africa (2005). His book, Shaped by War (2010) was published to accompany a retrospective exhibition at the Imperial War Museum North, Salford, England in 2010 and then at the Victoria Art Gallery, Bath and the Imperial War Museum, London. His most recent publication is Southern Frontiers: A Journey Across the Roman Empire, a poetic and contemplative study of selected Roman and pre-Roman ruins in North Africa and the Middle East. In 2012, a documentary film of his life titled McCullin and directed by David Morris and Jacqui Morris was released. The film was nominated for two BAFTA awards. In later years, McCullin has turned to landscape, still-life works and commissioned portraits. In November 2015 McCullin was named the Photo London Master of Photography for 2016, at the launch of Photo London, an art fair due to open at Somerset House in May 2016. A special exhibition dedicated to his work is to be commissioned. When asked about the rise of digital photography, he said: "Digital photography can be a totally lying experience - you can move what you want, the whole thing can’t be trusted really". Filmed in February 2018 and broadcast the following May, the BBC Four documentary The Road To Palmyra saw McCullin visit Syria with historian Dan Cruickshank to see the devastation left by the conflict on the UNESCO listed site of Palmyra. Discussing his trip with the Radio Times he spoke of his approach to entering war zones: "I have risked my life endless times, and ended up in hospital with all kinds of burns and shell wounds. I have those reptile eyes that see behind and in front of me. I’m constantly trying to stay alive. I’m aware of warfare, of hidden mines." Despite his reputation as a war photographer, McCullin has said that Alfred Stieglitz was a key influence on his work. Living in Somerset, he is married and has five children from his marriages. Émile Béchard, Femme du Luxor from McCullin's personal selection of photographs from the National Media Museum's collection, 2009. The Destruction Business. Open Gate Books. 1971. ISBN 0-333-13022-7. Is Anyone Taking Any Notice?. MIT Press. 1973. Anton Wallich-Clifford & Don McCullin (1974). No Fixed Abode. Macmillan Publishers. Jonathan Dimbleby & Don McCullin (1980). The Palestinians. Quartet Books. ISBN 0-7043-3322-8. Hearts of Darkness: Photographs by Don McCullin. Secker and Warburg. 1980. Don McCullin. (1983). Beirut: A City in Crisis. New English Library. ISBN 0-450-06037-3. Don McCullin. (1987). Perspectives. Harrap. ISBN 0-245-54368-6. Don McCullin ; introduction by John Fowles. (1989). Open Skies. Jonathan Cape. ISBN 0-224-02539-2. Norman Lewis & Don McCullin (1993). An Empire of the East: Travels in Indonesia. London: Jonathan Cape. ISBN 0-224-03230-5. Don McCullin (1994). Sleeping with Ghosts: A Life's Work in Photography. London: Jonathan Cape. ISBN 0-224-03241-0. Don McCullin ; (1999). India. London: Jonathan Cape. ISBN 0-224-05089-3. Cold Heaven. Christian Aid. 2001. ISBN 0-904379-47-7. Don McCullin; with Lewis Chester. (2002). Unreasonable Behaviour: An Autobiography. Vintage Books. ISBN 0-09-943776-7. Don McCullin (2003). Don McCullin. London: Jonathan Cape. ISBN 0-224-07118-1. Life Interrupted. Christian Aid. 2004. ISBN 0-904379-64-7. Don McCullin. (2005). Don McCullin in Africa. London: Jonathan Cape. ISBN 0-224-07514-4. Don McCullin (2007). Don McCullin in England. London: Jonathan Cape. ISBN 978-0-224-07870-2. Don McCullin (2010). Shaped by War. Vintage. ISBN 978-0-224-09026-1. Don McCullin (2010) A Day in the Life of the Beatles. London: Jonathan Cape. ISBN 9780224091244. New York: Rizzoli. ISBN 9780847836116. A day in the life of the Beatles: un giorno speciale con John, Paul, George e Ringo. Milan: Rizzoli. ISBN 9788817043793. A day in the life of the Beatles: söndagen den 28 juli 1968. Stockholm: Max Ström. ISBN 9789171262042. Don McCullin (2010). Southern Frontiers: A Journey Across the Roman Empire. London: Jonathan Cape. ISBN 978-0-224-08708-7. The Landscape. London: Jonathan Cape, 2018. ISBN 978-1787330429. 1965: World Press Photo of the Year 1964, Amsterdam, for his coverage of the war in Cyprus. 1965: Photo Stories, third prize stories, World Press Photo award 1964, Amsterdam. 1974: News Picture, first prize stories, World Press Photo award 1973, Amsterdam. 1977: Honorary Fellowship of the Royal Photographic Society (FRPS). 1978: Photo Stories, first prize stories, World Press Photo award 1977, Amsterdam. 1984: Spot News, second prize stories, World Press Photo award 1983, Amsterdam. 1993: honorary doctorate from the University of Bradford. 1993: CBE, the first photojournalist to receive the honour. 1994: honorary degree from the Open University. 2007: Royal Photographic Society's Centenary Medal. 2008: Honorary Doctorate of Letters by the University of Gloucestershire in recognition of his lifetime's achievement in photojournalism. 2009: Honorary Fellowship of Hereford College of Arts. 2011: Honorary Degree (Doctor of Arts) from the University of Bath. McCullin was knighted in the 2017 New Year Honours for services to photography. 2010–2012: Shaped by War: Photographs by Don McCullin, Imperial War Museum North, Salford, UK, 2010; Victoria Art Gallery, Bath, UK, 2010; Imperial War Museum, London, 2011–2012 in an updated form. A retrospective with Photographs, contact sheets, objects, magazines and personal memorabilia. 2013: Retrospective, National Gallery of Canada, Ottawa, Canada. "I am a professed atheist, until I find myself in serious circumstances. Then I quickly fall on my knees, in my mind if not literally, and I say : 'Please God, save me from this.'" "I have been manipulated, and I have in turn manipulated others, by recording their response to suffering and misery. So there is guilt in every direction: guilt because I don't practise religion, guilt because I was able to walk away, while this man was dying of starvation or being murdered by another man with a gun. And I am tired of guilt, tired of saying to myself: "I didn't kill that man on that photograph, I didn't starve that child." That's why I want to photograph landscapes and flowers. I am sentencing myself to peace." ^ a b c d Edemariam, Aida (25 August 2005). "The human factor (interview)". The Observer. ^ Leo Benedictus "Don McCullin's best shot", The Guardian (London), 29 March 2007. A shortened version of this interview, omitting this material, appears here . ^ a b c "Don McCullin interview: life in black & white". Amateur Photographer. Retrieved 2 September 2018. ^ McCullin, Donald; Lewis Chester (2002). Unreasonable Behaviour, An Autobiography. Vintage Books. pp. 28–29. ISBN 978-0-09-943776-5. ^ Peres, Michael R.; Osterman, Mark; Romer, Grant B.; Lopez, J. Tomas (2008). The Concise Focal Encyclopedia of Photography. Focal Press. ISBN 0-240-80998-X. ^ Philippe Garner, David Alan Miller, Blow Up (Steidl, 2011). ^ McCullin, Donald; Lewis Chester (2002). Unreasonable Behaviour, An Autobiography. Vintage Books. pp. 137–138. ISBN 978-0-09-943776-5. ^ Morris, Roderick (1997-10-30). "Don McCullin's Harrowing Images of War". International Herald Tribune. Archived from the original on 17 February 2009. ^ "Don McCullin". Exploring Photography. Victoria and Albert Museum. Archived from the original on 10 February 2007. Retrieved 2007-03-31. ^ Hodgson, Francis (19 October 2011). "Shaped by War: Photographs by Don McCullin, Imperial War Museum, London". Financial Times. London. Retrieved 24 July 2015. ^ Calkin, Jessamy. "Bleak Beauty". The Daily Telegraph. London. Retrieved 24 July 2015. ^ "Film in 2013". BAFTA. Retrieved 2 September 2018. ^ ""When I think of IS, I detest them beyond imagination": war photographer Don McCullin heads to Syria for new BBC4 documentary". Radio Times. Retrieved 16 December 2018. ^ "1964 Don McCullin WY". World Press Photo. Retrieved 2018-05-02. ^ a b c d "Don McCullin". World Press Photo. Retrieved 2018-05-02. ^ a b "Visions of England". Bradford Telegraph and Argus. Retrieved 2 September 2018. ^ "Honorary Fellowships (HonFRPS)". Royal Photographic Society. Retrieved 2 September 2018. ^ "Don McCullin biography". Under Fire: Images from Vietnam. Piece Unique Gallery. Retrieved 2007-03-30. ^ "John Daniel and honorary graduate Don McCullin". Open university. Retrieved 2 September 2018. ^ "Cornell Capa Award". Archived from the original on 23 April 2007. Retrieved 31 March 2007. ^ "Honorary degree recipients". University of Gloucestershire. Retrieved 2018-06-29. ^ "Annual Report 2012 (p11)" (PDF). Creative Space. Hereford College of Arts. Archived from the original (PDF) on 25 June 2013. Retrieved 7 December 2012. ^ "Shaped By War: Photographs by Don McCullin, Imperial War Museum North,". The Independent. 7 February 2010. Retrieved 2018-05-02. ^ Pulver, Andrew (11 February 2010). "Don McCullin". The Guardian. Retrieved 2018-05-02. ^ O'Hagan, Sean (7 February 2010). "Shaped by War: Photographs by Don McCullin". The Guardian. Retrieved 2018-05-02. ^ "Don McCullin exhibition in Bath". 4 August 2010. Retrieved 2018-05-02 – via news.bbc.co.uk. ^ Hodgson, Francis. "Subscribe to read". Shaped by War: Photographs by Don McCullin, Imperial War Museum, London. Retrieved 2018-05-02. ^ "Shaped by War: Photographs by Don McCullin: 7 October 2011 – 15 April 2012" Imperial War Museum. Accessed 2 May 2018. ^ Susan Hallett (4 February 2013). "Don McCullin's Post-Empire England | Literary & Visual Arts | Arts & Entertainment". Epoch Times. Archived from the original on 11 June 2015. Retrieved 13 August 2014. ^ "Don McCullin: A Retrospective". www.gallery.ca. Retrieved 2018-05-02. ^ "Don McCullin (Tate Britain exhibition)". Retrieved 2019-02-24. ^ Tate. "Don McCullin born 1935". Tate. Retrieved 2018-05-02. ^ a b c "Entre Vues : Frank Horvat - Don McCullin (London, August 1987)". Frank Horvat Photography. Retrieved 2 September 2013. ^ "BBC Radio 3 - Transcript of the John Tusa Interview with Don McCullin". Retrieved 25 November 2013. 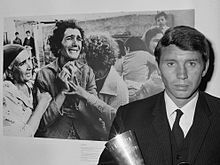 Wikimedia Commons has media related to Don McCullin.